﻿ Should tyre pressure monitoring systems be standard fit? Should tyre pressure monitoring systems be standard fit? Your votes are in! Over the last few weeks, we’ve been encouraging you to share your views on whether tyre pressure monitor systems should be a standard feature in new caravans and motorhomes. The poll generated lots of interest and although the final results are relatively clear cut, some of your comments suggest otherwise. It’s certainly a good point that a tyre pressure monitoring system should in no way replace regular checks of tyres for other visible problems such as cracks and bulges. 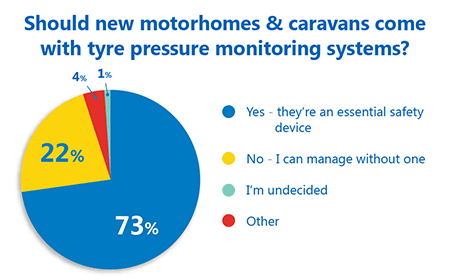 With a staggering 73% of the final vote, the majority of you voted in favour of having tyre pressure monitoring systems fitted as standard to all new caravans and motorhomes so there appears plenty of demand for this feature from current owners. As per the original poll post, we know only of Bailey’s Unicorn that are supplied with tyre pressure monitoring valves fitted to each caravan tyre as standard (although buyers then need to purchase the in car console to be able to monitor tyre pressures whilst towing). Maybe in years to come, other caravan manufacturers will follow Bailey’s lead, and could systems find their way onto motorhome base vehicles like we have seen in the car market? Only 22% of you voted against standard fit monitoring systems, whilst just 1% of voters told us they were undecided. Do you agree with 73% of voters? Join the conversation – share your thoughts and views in the comment box below. Would like to fit a tyre pressure monitoring system to my Bailey Unicorn. Anybody done this and any reendations? Many years ago I was driving along a motorway in a car (which didn’t belong to me) that (unbeknownst to me) had tyre monitoring on board . At one point I had a warning light come on which I didn’t recognise. I drove along for a while and when it didn’t extinguish I pulled into a service station and when checked, discovered a seriously low tyre pressure . I was advised that it was seriously close to a blow out. I think you may guess what my answer is! They do have their benefits Peter, thanks for getting in touch! The reason car makers are fitting tyre monitoring is due to lack of spare tyres, and because they appreciate that very few owners do any maintenance checks between annual services, also this is extra cost they can add margin to. I see tyre monitors along with DLR and all the other new rules as just adding cost and if tyres are properly checked/maintained, and drivers pay attention and don’t just turn up the stereo and rely on cruise control/lane guidance the actual usefulness is minimal. 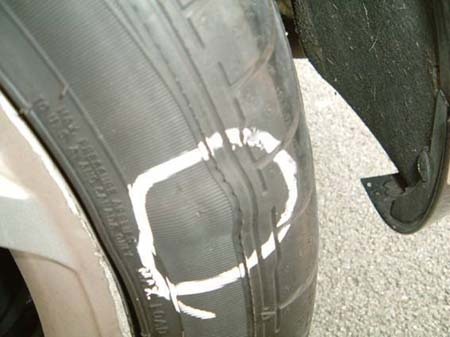 Assuming you carry out regular checks competently the most likely issue during a journey would be a blowout/puncture, which you should not need a flashing light to indicate! I think the main point is being missed, I have tyre pressure monitoring on my caravan and its prime use is to alert me of a problem during a journey. It measures temperature as well as pressure and I believe that increasing temperature is a good early indication of a problem that could lead to s blowout. It is certainly not a replacement for normal routine tyre maintenance.